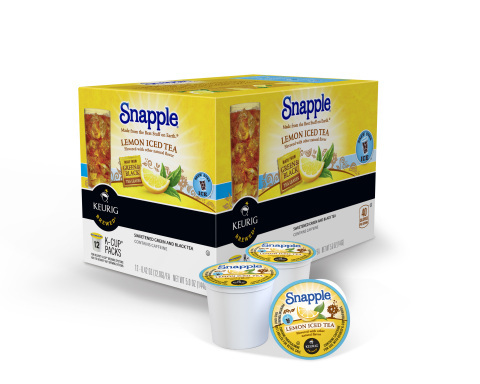 WATERBURY, Vt. & PLANO, Texas--(BUSINESS WIRE)-- Green Mountain Coffee Roasters, Inc. (GMCR) (NAS: GMCR) , a leader in specialty coffee and coffee makers, and Snapple today announced the launch of three delicious varieties of Snapple® K-Cup® packs for Keurig® single cup brewers. The much anticipated arrival of the new Snapple® K-Cup® packs includes the release of Peach Iced Tea, Lemon Iced Tea, and Raspberry Iced Tea. Snapple® K-Cup® packs are filled with the finest ingredients and offer a great-tasting iced tea experience with the ease and convenience of a Keurig® brewer. The new varieties join the current Brew Over Ice collection, an innovative line of beverages that are specifically crafted to brew directly over ice with any Keurig® brewing system, and deliver a full-strength, great tasting beverage every time. "We're extremely excited about the addition of Snapple to our Brew Over Ice beverage line-up," said Michelle Stacy, President, U.S. Commercial, GMCR. "Offering that great, delicious Snapple taste at the touch of a button from a Keurig brewer underscores our belief that there is a beverage for every taste, and an easy way to brew what you love at home simply." "We worked closely with GMCR to take the Best Stuff on Earth and cram it into a K-Cup pack," said Dave Fleming, director of marketing for Snapple. "The result is a great-tasting product that extends the Snapple brand to the kitchen counter, puts us in front of new consumers and gives our fans a convenient new way to enjoy Snapple teas, day or night." GMCR's Keurig® single cup brewers for in home and office utilize patented, innovative brewing and single-cup technology to deliver a fresh-brewed, perfect cup of coffee, tea, cocoa, or fruit brew every time at just the touch of a button. According to the NPD Group, Keurig® single cup brewers were the top four bestselling coffee makers during GMCR's fiscal second quarter 2013 by dollar sales. 1. Fill a 16-oz. cup (do not use glass) to the top with ice and place a Brew Over Ice K-Cup® pack in your brewer. 2. Press the 6-oz. or 8-oz. brew button for optimal flavor. Snapple® K-Cup® packs are available in 12- and 16-count K-Cup® boxes at grocery and retail stores nationwide, and in 22-count boxes online at www.GreenMountainCoffee.com and www.Keurig.com, for MSRP $9.79, $11.99, and $17.49, respectively. To learn more about Snapple® K-Cup® packs and Brew Over Ice, visit www.BrewOverIce.com. As a leader in specialty coffee and coffee makers, Green Mountain Coffee Roasters, Inc. (GMCR) (NAS: GMCR) , is recognized for its award-winning coffees, innovative Keurig® single cup brewing technology, and socially responsible business practices. GMCR supports local and global communities by investing in sustainably-grown coffee, and donating a portion of its profits to social and environmental projects. GMCR routinely posts information that may be of importance to investors in the Investor Relations section of its website, including news releases and its complete financial statements, as filed with the SEC. The Company encourages investors to consult this section of its website regularly for important information and news. Additionally, by subscribing to the Company's automatic email news release delivery, individuals can receive news directly from GMCR as it is released. Snapple, a brand of Dr Pepper Snapple Group (NYS: DPS) , is a leader in great-tasting premium beverages. Founded in 1972 by three childhood friends, Snapple got its start in Greenwich Village, New York and is now available throughout the United States. Snapple prides itself on developing, producing and marketing a wide variety of premium beverages, including ready-to-drink iced teas, juice drinks, 100% juices and water. DPS is a leading producer of flavored beverages, marketing Snapple and 50-plus other brands across North America and the Caribbean. For more information, visit www.Snapple.com or www.DrPepperSnapple.com. For the brand's latest news and updates, follow Snapple at Facebook.com/Snapple or Twitter.com/Snapple. For Green Mountain Coffee Roasters, Inc. The article Snapple and Keurig Quench America's Thirst with Nationwide Launch of Snapple K-Cup packs for Keurig Brewers originally appeared on Fool.com.